There are surely hundreds of regional interpretations of this tune, few knows of its origin and its importance to the New York City midway and sideshows of the early nineteenth century. Best known as “The Streets of Cairo,” it is oftentimes connected to visions of Arabia and Egypt, to snake charmers, belly dancers, and other mysterious notions of Near East mysticism. Although not quite “a place in France,” there were certain locations in New York where the fabled song came to life. “The Streets of Cairo” sideshow was constructed on Surf Avenue, Coney Island, after the success of the Algerian Village at the World’s Columbian Exhibition in Chicago in 1893. Sol Bloom, the entertainment director of the Columbian exposition, claimed to have composed the melody as the theme for the “Algerian” performances. (The song can actually be traced back much further to the 1700s Arabic song “Kradoutja”). Because Bloom did not copyright the song, New York vaudevillian entertainers quickly purloined the tune. Byron and Company. Show at Coney Island with a man “levitating” a woman on stage, ca. 1908. Byron and Company. 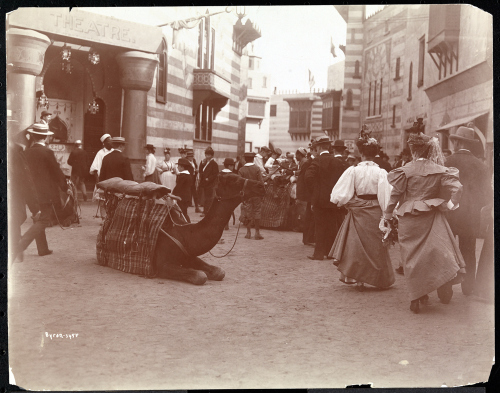 Crowd wandering through the “Streets of Cairo” show with camels at Coney Island, ca 1896. The Victorian taste for Oriental exoticism was insatiable. It was a time of ardent ethnographic interest; the richly illustrated National Geographic Magazinelaunched in 1888 and commercial photographs of the region were sold for home entertainment in the form of stereographs and ready-made travel albums. The awe-inspiring sight of the ancient, enigmatic pyramids and startlingly divergent culture was both frightening and alluring. During a time when overseas tourism was reserved for the elite, “The Streets of Cairo” transformed the sands of Coney Island Beach into that of an Arabic desert for the middle and working classes. It is likely that the Atlantic Ocean beyond its walls was a welcomed mirage on sweltering summer days. Byron and Company. 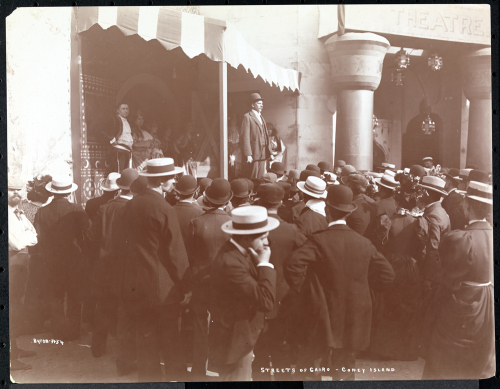 Crowd watching a barker at the “Streets of Cairo” show at Coney Island, ca 1896. Byron and Company. 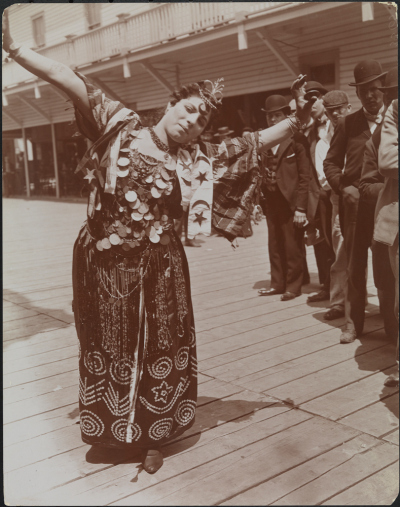 Woman gypsy/dancer posing outside at Coney Island, ca 1896. Museum of the City of New York. “Little Egypt” became an adopted stage name for the main dancers of the “Streets of Cairo” exhibit, the most famous of whom were Farida Mazar Spyropoulos, Ashea Wabe, and Fatima Djemille. The “hootchy cootchy” they performed was a caricature of traditional Middle Eastern dance that was more like an early form of burlesque. Although under an ethnographic guise, this risqué performance was perceived as quite provocative at the time. This oriental cliché quickly became a fad (up to 20 “cootchy shows” would be performed at one time) and “Little Egypt” attained celebrity status. Ashea Wabe made front page news when she was busted for dancing at socialite Herbert Seeley’s Fifth Avenue Bachelor Party in 1896; the scandal came to an unfortunate end in 1906 when she was found dead by asphyxiation, leaving behind a $200,000 fortune. Byron and Company. Woman gypsy/dancer seated in her side-show theatre at Coney Island, ca 1896. Museum of the City of New York. 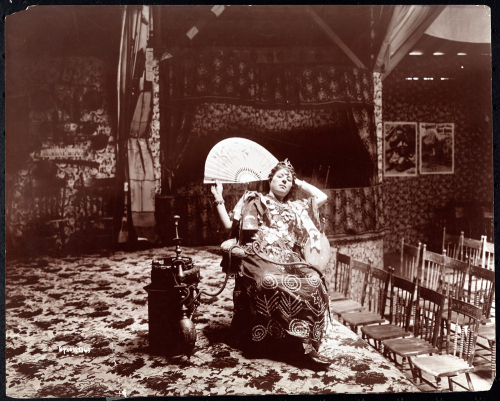 This photograph depicts a “Little Egypt” dancer smoking a Hookah in her harem. One can imagine the scent of tobacco and incense in the densely packed theatre. Even at Coney Island, the attire of the audience would have been conservative, with suit jackets and long dresses scarcely baring an ankle or wrist. In stark contrast, the dancer’s gauzy silks and potentially exposed midriff must have been startling. Byron and Company. A woman in a carnival or side-show with three large pythons, ca 1895. Museum of the City of New York. 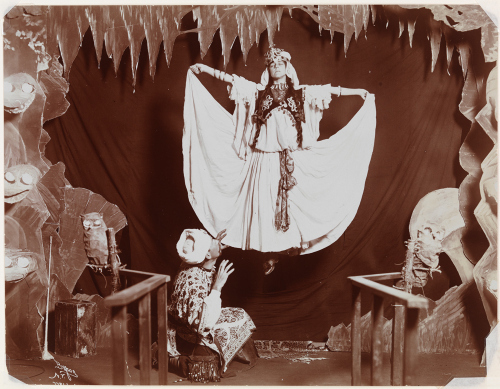 A precedent to “The Streets of Cairo,” female snake charmers added a touch of Eastern mysticism to the classic side show lineup. 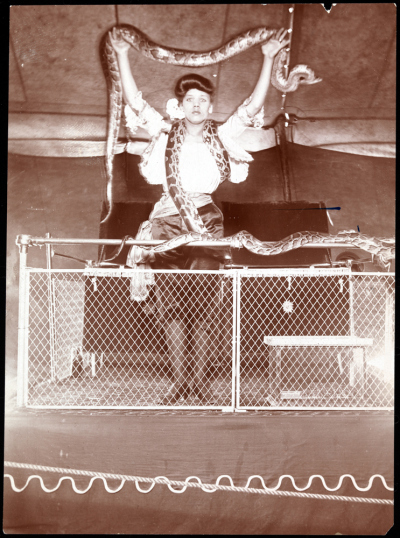 The snake charming tradition dates back to Ancient Egypt and is still practiced today at the Coney Island Circus Sideshow. Byron and Company. Arabian Acrobats demonstrating acrobatic feats on the roof of Hammerstein’s Victoria Theatre, ca 1908. Museum of the City of New York. For those who chose not to make the expedition down to Coney Island for their Oriental fix, the uniquely landscaped roof of Hammerstein’s Victoria (42nd Street at 7th Avenue) served as an alternative. Hammerstein produced a vaudeville adaptation of Oscar Wilde’s Salomé that emphasized the notorious “Dance of the Seven Veils” and ran an astonishing 22 weeks. 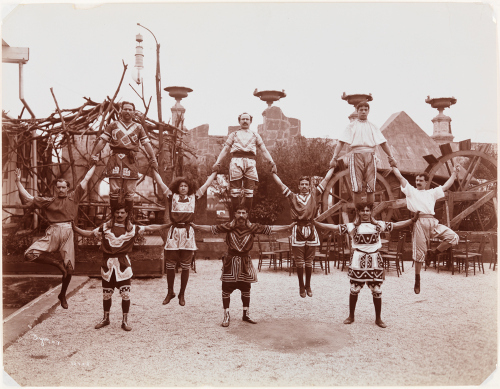 The above photograph depicts the incredible feats of strength performed by Arabic acrobats, it is possible that a similar display was presented as an opening act. Byron and Company. 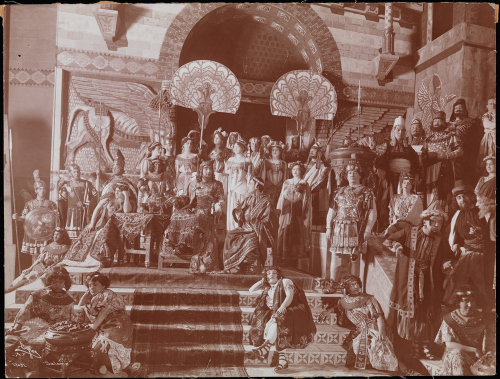 The operatic adaptation of Oscar Wilde’s “Salome” with music by Richard Strauss, presented at the Metropolitan Opera House on January 22, 1907. Museum of the City of New York. Byron and Company. 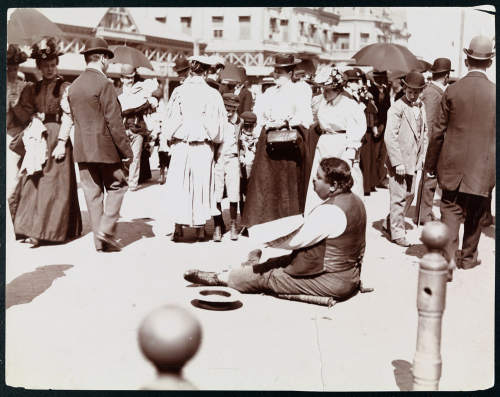 Beggar among the crowd on Surf Avenue, Coney Island, ca 1896. Museum of the City of New York. As the first wave of British and French colonialism came to an end, the tawdry cultural stereotypes of the Middle East lost popularity in the sideshow circuit. Although the Hootchy Cootchy show faded from view as if an apparition, American culture remains deeply entranced by the melody. The next time you hear the infamous tune, peer through the “hole in the wall” to old New York and, if possible, allow yourself to be seduced by Little Egypt.